The armed Royal Irish Constabulary (RIC) was Ireland’s major police force for most of the nineteenth and the early twentieth centuries. A separate civic police force, the unarmed Dublin Metropolitan Police controlled the capital. The cities of Derry and Belfast had special divisions within the RIC. The RIC was disbanded in 1922. It was replaced by two new police forces. 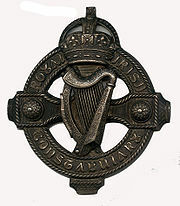 The Garda Síochána (Guardians of the Peace) patrolled in the Irish Free State (now the Republic of Ireland). The Royal Ulster Constabulary (renamed after the Good Friday Agreement the Police Service of Northern Ireland in 2001) patrolled the Northern Ireland state, which remained in the United Kingdom. The Dublin Metropolitan Police Force was disbanded in 1925, when it was incorporated into the Garda Síochána. About seventy five percent of the force were Roman Catholic and about twenty five percent were of various Reformed Church persuasions, in line with Irish demographics. The RIC’s successful system of policing influenced the Canadian North West Mounted Police, the Victoria Police force in Australia, and the Royal Newfoundland.